You are interested in understanding gasses and pressure and how an Open Circuit diver, compared to a Close Circuit diver manage their Partial Pressure of Oxygen, PPO. Fair enough. It’s quite simple actually. We will define an Open Circuit diver as a recreational diver using a single scuba tank, where a Closed Circuit diver is one using a rebreather. If you are contemplating a rebreather course, no matter which Closed Circuit rebreather you choose, the principles you are about to learn are the same. Before we move onto the subject of Closed Circuit, let us first review how the Partial Pressure of Oxygen, PPO is managed by the Open Circuit diver and how pressure affects a gas as a diver ascends and descends as well as how the Open Circuit diver manages their gas, pressure and PPO. Once you possess an understanding of the fundamentals of gasses under pressure, the effects of that gas on the body, and how that is applied while diving on open circuit, you may move on how gas is managed while diving on rebreathers. The contrast and comparisons of Open Circuit to Closed Circuit will make understanding Closed Circuit easier. I would encourage you to read the whole article, so that we are all on the same page and that a perception does not lead to misconception. If you feel you understand the fundamental concepts of gas under pressure, how a given gas affects the body and how that combined with open circuit works, then skip to the section on Closed Circuit. If you are new to diving or new to the rebreathers, do not feel intimidate by the acronyms and the formulas about to be presented. Though terminology, and acronyms may be new they should be a part of your arsenal of knowledge. What you are about to be introduced to does not apply to just divers, it applies to anyone subject to a differential pressure, for example, pilots, astronauts, mountain climbers and in this article we are using divers. To set our baseline, we need to make some Assumptions. Those assumptions will eliminate the “but this” and “but that” statements and do not represent the absolute but just one line out of multiple lines of options available. Recreational Open Circuit, meaning just a single tank. We will use whole numbers for simplicity sake. We will ignore all the other gasses, except were another gas may be needed as a reference or example. Pressure applied to a gas, the density increases and the volume decreases. For the inverse pressure relieved on a given gas, the density decreases and the volume increases. Acronyms used throughout this example. PPO : Partial Pressure Oxygen..
One cubic foot of fresh water weighs approximately 62.4 lbs. Boyle’s Law: Boyles law applies pressure to a given gas at a constant temperature. Volume decreases while density increases as pressure is applied as molecules become more packed. As pressure increases, partial pressure increases. As pressure decreases, partial pressure decreases. Charles Law: Charles law applies temperature to Boyle’s Law. An increase in temperature increases volume while a decrease in temperature decreases volume. I want to bring to your attention this guy Charles. The application of temperature does affect volume and density. For practicality we will leave Charles Law out of the examples and use only Boyle’s law. Temperature does play a part on its effect on gas. Though the amount of temperature is small when compared to the weight of water, that weight is much more significant and obvious on a given gas and the reason why we will use just the weight of water in the following examples. We know the pressure the weight of air exerts on the surface of the ocean to be ~14.7psi. We know this to be 1 atmosphere of pressure. Expanding that concept to the weight of water, the more water you stack on top of you, the more weight is exerted upon you. The less water the less weight. We now see moving down and up the water column adds or removes pressure. We know the column of 396 cubic inches of water from a depth 33 feet to the surface exerts ~14.7psi. Every 33 feet of sea water exerts the same amount of pressure per square inch as the column of air exerts on the surface of the ocean. Therefore every 33 feet of sea water exerts 1 atmosphere of pressure. When you hear the term Atmosphere Absolute or see the acronym ATA that is referring to Absolute Pressure. When referencing Absolute Pressure, you are including not just the atmosphere of water but the one additional atmosphere of air. The formula to calculate Atmosphere Absolute, ATA is: (( Depth / 33 ) + 1 ) where the + 1 represents the 1 atmosphere of air, the second A in ATA. Therefore the atmosphere of water plus the one atmosphere of air equals ATmospheres Absolute, ATA. Let us look at the equation to calculate ATA. If you were at 66 feet, the equation would be (( 66 / 33 ) + 1) = (( 2 ) + 1) = 3 ATA. 80 feet would be calculated as (( 80 / 33 ) + 1) = (( 2.42 ) + 1) = 3.42ATA. See how this works? You will need the knowledge to calculate ATA later in this paper. 20.47 is the psi exerted by the weight of water, 14.7 is the psi exerted by the weight of air. Add the weight of water to the weight of air and you get Atmospheres Absolute, ATA. (The two calculations do not match because numbers used are truncated down to one to three decimals). At 46 feet of sea water, you would be at 2.39 ATA and have ~35.17psi pressing exerted on you. Now that we have a foundation set, how pressure affects a gas, concepts, and formulas to calculate ATA and psi, let’s look at how pressure affects the gas we carry and apply that to a new acronym, PPO, Partial Pressure of Oxygen. Partial Pressure of Oxygen, PPO, what is that referring to? Let’s take a slight detour for a minute. 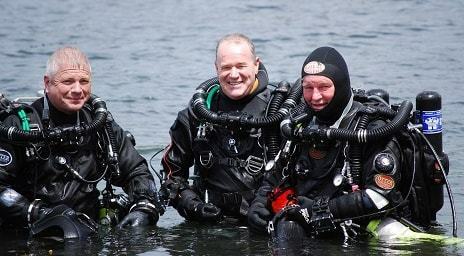 This detour may help bring to light what Open Water Divers are trained for. Let us compare and contrast what recreational open water divers are taught and practice vs. someone on a more technical level. The Recreational Open Water diver is taught to monitor time at depth to minimize the accumulation of nitrogen in their tissues so not to go into a required decompression stop. This article does not go into the details of decompression diving. That goes beyond the scope of this article but a description of decompression diving is provided to help the audience understand the concept of decompression diving and why recreational open water divers do not go into this state. Decompression or decompressing is the act of pausing for a specified amount of time at a specified depth. This allows time for excess nitrogen accumulated during the dive to escape the body. Decompression may be managed in stages and require a significant amount of time and gas underwater to accomplish. To perform decompression dives, pre-dive planning considering a number of factors such as the amount and type of gas to carry, depths and time spent at depth, amount of nitrogen accumulated, decompression obligation stops and times and the mix of gas to use at specific depths. Open water recreational divers are taught the times allowed at depth represent an attempt to keep a diver out of decompression that allow for direct ascent to the surface without having to pause the ascent to off gas. As a diver descends, the Partial Pressure of a gas increases and the amount of nitrogen absorbed increases. The diver begins nitrogen saturation as soon as they descend from the surface and continues to absorb nitrogen at all points between equilibrium and the surface. As the diver accumulates more nitrogen they become supersaturated. It is called supersaturation because the base saturation level is defined at Sea level. Sea level is the baseline where they are considered fully saturated. As the diver descends, the amount of nitrogen stored in the body increases. When the diver begins their ascent, the excess nitrogen begins to leave the tissues and eventually escape the body. The deeper and longer the diver goes and stays, the more saturated they become. Therefore in recreational diving, depth and time are limited so not to place an individual in a state where they must pause the ascent and remain at a specified depth to off-gas excess nitrogen before reaching the surface. Once on the surface, they have the option to spend time on the surface to continue off-gassing excess nitrogen before making their next dive. The amount of time on the surface will dictate the time penalty for any consecutive dive due to excess nitrogen retained in their body. Back to our subject of Partial Pressure of Oxygen. Please note I am providing both the oxygen and the nitrogen in the examples, even though at this point we’re only interested in the oxygen. I provide the nitrogen because later you will learn the effects of this gas under pressure, hence when the PPN rises, the body will have certain physiological effects. The percentage of a given gas at a given depth is known as the partial pressure of gas. When applied to oxygen, for example, that would be denoted as PPO, or partial pressure of oxygen. The two figures below show two different fills as an example of percentages or fractions. The fraction of the gas inside a scuba tank filled on the left contains 21% oxygen and 79% nitrogen. The fraction of oxygen is 21% and the fraction of nitrogen 79%. The tank of the right, oxygen occupies 32% and nitrogen occupies the rest of the space at 68%. Let’s continue the example using the tank on the left. Take a deep breath from your tank filled with air at the surface and you inhaled 21% oxygen and 79% nitrogen. Take a deep breath from that same tank at 33 feet and you inhaled the equivalent of 42% oxygen and 158% Nitrogen! What? How do you figure? Take the ATA and multiply it to the percentage of a given gas.. Since we know 33 feet of sea water is 2ATA, we multiple 2 x .21 = .42 or 42% oxygen. 3 x .21 = .63 or 63%.. A breath taken at 66 feet is the “equivalent” of 63% oxygen and 237% nitrogen. 99 feet? 4 x .21 = .84, the equivalent of 84% oxygen and 316% nitrogen at 99 feet. 132 feet? 5 x .21 = 1.05, the equivalent of 105% oxygen and 3.95 or 395% nitrogen. Note: Your PPO just exceeded the 100% mark. ATA multiplied by the percentage of oxygen in the tank is known as your PPO (Partial Pressure of Oxygen). 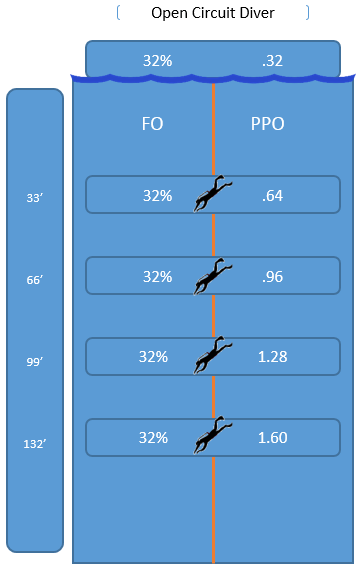 The PPO at 132 feet is 1.05. The PPO at the surface is .21. It is the value of PPO divers need to be conscious of. The reason why will come later. For now, know that PPO exists and how PPO is calculated. Please note, with a cylinder filled with 21% oxygen, while at 132 fsw, you are breathing the equivalent of 105% oxygen. The most you can breathe at sea level is 100% oxygen. At 132 feet you have exceeded 100% oxygen. How can this be? Even though the volume you take in remains the same, pressure makes the air denser. Let’s say for example that on every breath you take on the surface, you take in 1 quart. That 1 quart on the surface contains X number of oxygen molecules per square inch. That one quart at 132 feet contains 5 times as many oxygen molecules per square inch. You are filling your lungs with much more compressed gas. Why is this? The answer is density. Density due to pressure. At 33 feet, there are twice as many oxygen molecules in the same square inch compared to the square inch at the surface. At 66 feet, there are three times as many oxygen molecules per square inch, 99 feet, 4 times as many molecules/sq. inch, etc.. All this is due to pressure… Pressure makes your gas denser. At 132 feet, your partial pressure of oxygen would be? You might say: My PPO is ONE POINT ZERO, or ONE POINT ZERO FIVE, or ONE POINT ONE. Everyone is a little different. Some may drop the 5 in .05, some may round the .05 up to .1, hence 1.1, etc. Whatever you do, error towards the side of caution. Take a moment to absorb what you have been taught. Beginning to feel like rocket science? It may seem like a lot. After a while, it becomes easier. Is it important to know what your PPO and maximum depth for a given mix is? Yes! For the purpose of this article, the PPO is what the rebreather diver is capable of controlling. The rebreather diver can maintain a constant PPO regardless of depth where the open water diver’s PPO fluctuates based on the percentage of oxygen in their tank and their rise and fall within the water column. More on how a rebreather diver manages their PPO will come later. Next, let’s look at the effects of a given gas. This will help answer the why. Why is it important to know? Why is it not good to not know? At sea level we breathe in 21% oxygen and 79% nitrogen. The body metabolizes oxygen and the byproduct of this metabolism is carbon dioxide and bicarbonate. Using our assumption that we metabolize 5% of the oxygen we inhale that leaves 16% oxygen not metabolized. So on a given breath, we inhale 21% oxygen and 79% nitrogen and we exhale, 16% oxygen, 79% nitrogen and 5% CO2. Nitrogen is inert. We do not metabolize nitrogen. 79% in and ~79% out. I say approximate, because some of the nitrogen gets trapped in its travels to all parts of the body. Nitrogen absorption is monitored by all divers. The dive tables taught in the open water course are based on nitrogen load. The load is the amount of nitrogen retained in the body tissues during a dive. This load leads to dive times and depths and shortened dive times and depth for repetitive dives. If a sufficient amount of nitrogen is accumulated in the body and not allowed to be released, it could lead to a decompression obligation and what is known as the bends. Other effects may be felt such as malaise, pain in the joints, stupor, tinea and more. Oxygen is needed for our survival. Too little and we eventually pass out. Too much and it becomes an irritant on our organs. On the surface, the most we can take in is 100%. How do you get the percentage of oxygen to go higher than 100%? You apply pressure. You were introduced to an example earlier when a diver reached 132 feet their PPO was at 105%. How does a diver apply pressure? The simple fact that a rise and fall in the water column has the PPO of any given gas rise and fall proportionately. Watch this U.S. Navy experimental diving unit’s test on oxygen toxicity. This is one example for the reason which answers why. How do divers monitor the percentage of a given gas while at depth? They use a dive computer or during the planning phase of a dive they determine the mix of gas they would like to use, the depth they plan to travel and the time at depth. They do all this to help reduce the chances of any problems caused by the accumulation of any given gas. Divers who hold a certification in Enriched air are allowed to receive fills that contain a percentage of oxygen greater than 21. Divers are taught in more advanced courses, such as Enriched Air, aka Nitrox to limit the PPO to a max level. For example, The Professional Association of Dive Instructors, PADI prescribes the following standards, The PPO for any given dive should not exceed 1.4, with a contingency of 1.6. This means the divers need to know the MAX depth they plan to dive and the Percentage of oxygen to fill a tank so not to exceed a PPO of 1.4. Years of research by the U.S. Navy and other organization, have the recreational tables providing a safe level of gas retention that reduces the risk of any adverse reaction the body may experience. No two individuals are alike so there are no guarantees. How do you calculate the Maximum Depth on a given mix of gas? The formula is: TOD=((( PPO / FO ) – 1) * 33 ). If you watched the video you see what can happen when the PPO gets too high for a prolonged period of time. They would surely be in a grave situation if unmanaged or unassisted. This is why it is IMPORTANT to know the PPO for the depth you plan to dive BEFORE you begin the dive. To know that, the diver must know the percentage of oxygen in the tank and the planned depth. During a dive, how does an open circuit diver manage the PPO? Simply by rising and falling in the water column. The deeper the open circuit diver goes, the higher the PPO goes. The shallower a diver gets, the lower the PPO gets, to the point they reach the surface and return the PPO of the percentage of the given gas found in the cylinder. Everything you have been introduced to up to this point was to provide a foundation of understanding. The weight of water, types of gas a diver deals with, how pressure affects a gas, effects of gas under pressure, and the partial pressure of a gas. We have learned for an open circuit diver to control their PPO they have two things they can do, control the percentage of oxygen placed in the cylinder and control their depth. A change to one or both changes the PPO. As for nitrogen, when the partial pressure of nitrogen reaches a level where that level is high enough to adversely affect the nervous system, the diver may being to experience the feeling of drunkenness or feel like they are on narcotics. Someone coined the phrase the Ti Many Martoni’s effect, (a pun on Too Many Martini’s) when a diver goes into this drunken state. Some divers may realize they are “narced,” some may not. Some divers have learned to control themselves while in this state, others not. What if you could control your PPO, keep it constant regardless of your depth? What if you change the PPO at will? For example, if you could maintain a constant PPO of say 1.1 whether you were at 30 feet or 300 feet. Would this feature be beneficial? Let’s find out. Both types of divers start the dive with a given mix of gas, both move up and down the water column, metabolize oxygen, and retain nitrogen. The difference is the rebreather diver gets to manage the FO in what is called the loop. The loop is the closed circular conduit where all gasses travel, denoted in blue and red in the illustration. It’s called closed because unlike an Open Circuit diver, when a rebreather diver exhales what they exhale does not escape into the water. The exhaled gas and any new gas are retained within the loop. The rebreather divers gets to rebreath the gas from the previous exhale, minus the carbon dioxide. Remember that statement above describing 21% oxygen in and 16% oxygen out? That 16% instead of being thrown away into the water column, which the open circuit divers experiences, that 16% is retained in the loop and will be metabolized on the next breath. It is recycling exhaled oxygen instead of throwing it away. Since the open circuit diver CANNOT change the FO in a given tank during the dive their FO is set at the time they get their tank filled. An open circuit diver controls the PPO by simply rising and falling in the water column. When a rebreather divers moves up and down the water column, their PPO does not change because the computer continually adjusts the FO in the loop. Their FO changes to maintain a constant PPO. The rebreather diver gets to control the FO through the computers they wear, or manually. The rebreather diver can change the FO. They tell the computer to maintain a constant PPO and the computer adjusts the FO. This is completely the opposite of what the open circuit divers can do. The rebreather divers sets the computer to maintain a constant PPO, therefore adjusting the FO hence their PPO regardless of depth. The Open Circuit diver controls the PPO by rising and falling in the water column. Their FO remains constant. The Closed Circuit diver controls the FO by rising and falling in the water column. Their PPO remains constant. Example, the rebreather diver enters the water telling the computer they want a constant PPO of 1.1. The rebreather diver has total control over what PPO they want at any time regardless of depth. From there, the computer will adjust the FO so the PPO remains relatively close to the PPO the rebreather diver set. The rebreather diver will set a point, the PPO they wish to start with, while on the surface. For example let us use 1.1. At this point the computer beings to inject Oxygen into the loop to bring the PPO up to 1.1. As the Rebreather diver descends the PPO rises (( Depth / 33 ) + 1 ) * FO), and will continue to the point the computer recognizes the PPO is 1.1 or higher. As the diver continues to descend PPO continues to rise. The computer recognizes this and freezes any introduction of Oxygen into the loop if the PPO is 1.1 or higher. This allows the diver to metabolize the Oxygen in the loop while the computer maintains the FO at a value that will maintain the PPO at what the diver has set. As Oxygen is metabolized, and as the diver continues to descend, PPO keeps rising (gas under pressure) and the computer delays injection, or injects a little to maintain a FO that keeps the PPO at a relative 1.1. Once the rebreather diver reaches their TOD, the PPO stops rising and the FO in the loop continues to drop, as the diver metabolizes the Oxygen. The computer recognizes the FO drop to a point that has the PPO dropping below what the diver set and injects enough Oxygen to bring the FO up to keep the PPO close to the point the diver set. Let’s pause and work through a few challenge questions to test your understanding up to this point. Work the challenges. Try not to look at the Answers until after you worked the Challenges. Challenges are to provide you with a baseline of what you understand at this point. If you fail to answer the challenge questions correctly, review may be prudent. We will use 1.0 PPO and both the open and close circuit diver will dive to the same TOD. Question: What is the formula to calculate PPO? Question: What is formula to calculate FO? The Open Circuit diver using a mix of 32% Oxygen, 68% Nitrogen. Question: At what depth will the Open Water diver be when their PPO reaches 1.0? The Rebreather diver, set their computer for a 1.0 PPO. As the rebreather diver descends, the PPO rises and the FO in the loop begins to drop, due to the diver metabolizing the oxygen. As the diver continues to descend, their PPO may rise in relation to the oxygen remaining in the loop. The unknown variables are the rate of metabolism and descent, which is hard to determine in this exercise. It’s a balancing act between the depth, speed of descent / ascent, rate of metabolism and the computer calculating all this that tells the computer to or not to inject oxygen into the loop. The open circuit diver is waiting at 70 feet for the Rebreather diver. Here is where the difference begins to show itself. What is the FO for the open circuit diver at 111 feet? What is the PPO for the open circuit diver at 111 feet? What is the FO for the rebreather diver at 111 feet? What is the PPO for the rebreather diver at 111 feet? What is the FO for the open circuit diver at 132 feet? 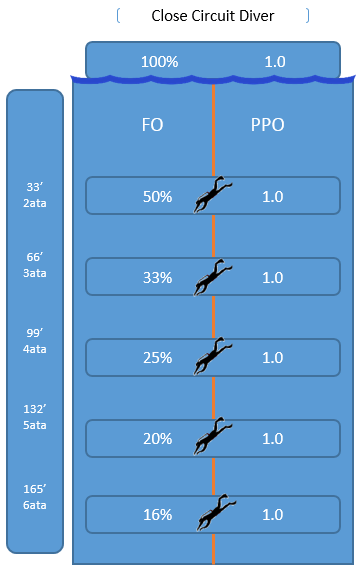 What is the PPO for the open circuit diver at 132 feet? What is the FO for the rebreather diver at 132 feet? What is the PPO for the rebreather diver at 132 feet? The open circuit diver descends their FO remains constant while their PPO changes. The closed circuit diver descends their FO changes while their PPO remains constant. Why does the open circuit divers FO remain constant while their PPO rises? Why does the rebreather divers FO fluctuate while their PPO remains constant? To help you out a little, you need to understand how a rebreather works. A rebreather uses a pair of computers to monitor the percentage of oxygen in the loop. The loop are the hoses and all the parts connected, that make up a circular conduit which all gas pass through. The computers monitor the percentage of oxygen in the loop and adjusts that percentage to maintain the PPO the diver has set. The rebreather diver carries two tanks attached to the loop. 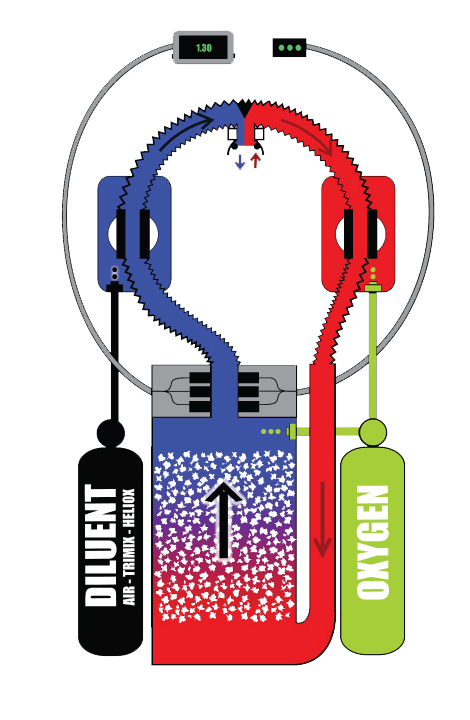 One is called a diluent, which is air (oxygen and nitrogen) or a trimix blend. Trimix is a blend of three gasses, oxygen, helium, nitrogen. In trimix, helium is used to replace some of the nitrogen. Trimix diving goes beyond the scope of this article but is introduced as a seed of knowledge. The second bottle is 100% oxygen. You have learned as pressure rises, so does the PPO. In the rebreather the computer will detect this rise in PPO and pause any injection of oxygen into the loop. This facilitates maintaining a PPO set by the diver. Once the diver reaches their target depth, the PPO settles. As the diver metabolizes the oxygen in the loop, the PPO begins to drop, due to the FO in the loop dropping. The computer senses this drop in PPO and injects a small percentage of oxygen into the loop that maintains the proper FO that will have the PPO maintained relatively close to what the diver set regardless of depth. As the rebreather diver ascends, their PPO drops. The closed circuit computers sense this drop in PPO and begins to inject oxygen into the loop to try and keep up with the dropping PPO. That is the essential comparisons and differences between open circuit and close circuit divers. You now have the fundamentals to provide you with the knowledge to compare and contrast both open circuit and closed circuit divers. I intended for this article to enhance your knowledge opening up a whole new understanding. During this course of reading this article, you were introduced to many concepts that apply to both the open circuit and the closed circuit diver. You were introduced to acronyms, formulas that apply to both the open circuit and closed circuit divers. You began with how gasses are affected by pressure. How the principal of gasses under pressure apply to both the open circuit and closed circuit diver the same way. You learned the contrast of how the pressure of gasses are managed by open circuit divers and closed circuit divers. Finally you learned how each of the two classes of divers manage their gasses, where the open circuit diver manages through determining the max depth and the Max PPO. This helps them determine the percentage of oxygen they will put in their tank because the open water divers FO remains constant while their PPO fluctuates. As for the rebreather diver, they manage their FO to maintain a constant PPO. The difference between the open circuit diver and the closed circuit diver is the open circuit diver may not change the fraction of oxygen in their tank while diving but may change a gasses Partial Pressure by simply rising and falling in the water column where the closed circuit dive may change the FO in their loop to maintain a constant PPO, regardless of their rise and fall in the water column.